Staging the kitchen before placing your home on the real estate market can make the difference between a quick sale or having your home linger on the market for months. Kitchens rank very high on a home buyer’s priority list, and the condition of your kitchen can make or break a home sale. With high expectations for this room, home buyers are looking for updated kitchens with that “holy grail” duo of stainless steel appliances and granite countertops. If your kitchen doesn’t meet these standards, don't despair! You don't have to do a complete kitchen renovation to sell your home fast. There are many diy fixes and home staging tips that can make your kitchen look more appealing to a wider number of home buyers. If you plan on doing a kitchen renovation before placing your home on the market, avoid making it too trendy. Kitchen decor styles are fickle, and you don't want to invest in a kitchen renovation that loses favor five years down the road! Home buyers know this and may not want to buy a house where the most expensive room is too "taste specific" or trendy. For small kitchen design help, see small kitchen decorating ideas for diy tips on making a small room appear more spacious. Before staging the kitchen, you should declutter, clean, and make any necessary repairs. Every countertop doesn't need to be filled with fruit, appliances, vignettes or trailing ivy. I see many pictures of staged kitchens with ivy strewn across the countertops, tucked in a pile in a corner, or creeping down the sides of upper cabinets! The result always looks messy. Limit yourself to no more than two appliances on the kitchen countertops, IF you have plenty of space. For small kitchens, remove all appliances. I know this is difficult if you are occupying your home during the sale, but remember, your goal is to make your kitchen look more spacious. 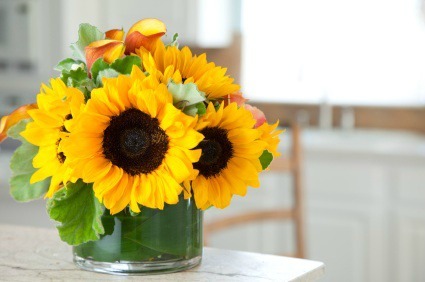 Place a live plant or vase of flowers on the counter-- just one will do the trick. 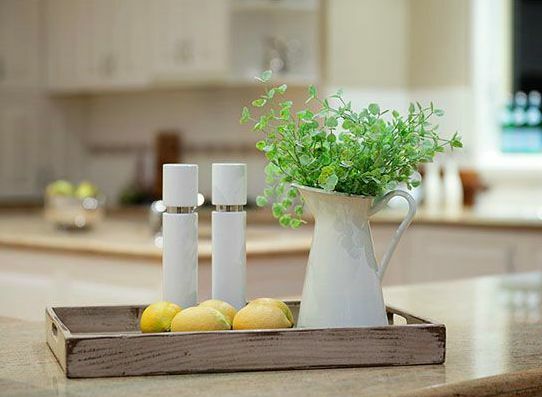 Create one tempting vignette on a kitchen counter, using elegant bottles of oil and vinaigrettes in varying heights and shapes. Place together with a small breadboard, bread knife, and a rustic loaf of bread. Lay out contemporary (no ruffles or lace!) placemats, place settings, wine glasses for two, with a bottle of wine on your island countertop or peninsula. Practically everything looks good when arranged on a tray. Be creative, create a vignette inside the tray with; a tea set, desserts, a loaf of homemade bread, glass containers filled with herbs, a utensil crock, and so on. Cupcakes or cookies look irresistible when placed on a pretty tiered cake stand! 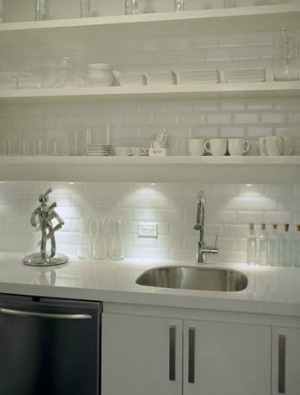 Be sure that the work station (sink, stove, and fridge) has proper task lighting when staging the kitchen. If not, install strip lighting under the cabinets for task lighting. Go to lighting for kitchen lighting ideas. Apply affordable battery-operated puck lighting for task lighting. Puck lights stick on with an adhesive, you simply press them into place wherever you want. Puck lights can be found at any home center store, or Amazon. Display colorful fruit in a pretty bowl or basket. 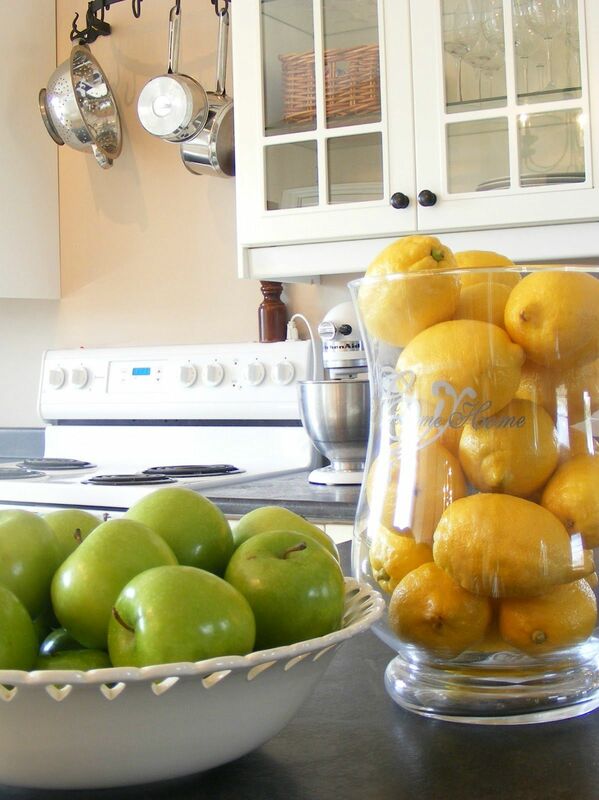 Oranges, limes, and lemons add a fresh splash of color to any kitchen decor, and will make feng shui buyers happy. During the holidays, fill bowls or glass containers with pomegranates or mandarins. Fill a wire or straw basket with natural colored eggs. Add a cluster of grapes to your kitchen decor, allowing them to flow creatively over the edge of a bowl. 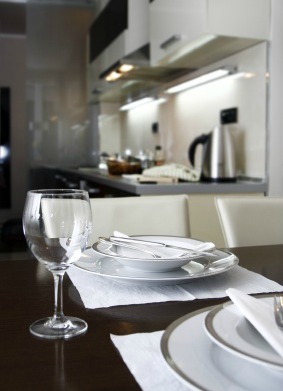 To freshen your kitchen before viewings, run some lemon or lime halves through the garbage disposal. 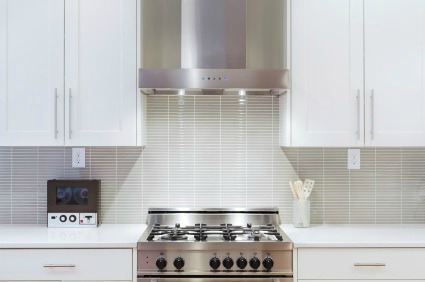 The most important thing to know about kitchen appliances when selling your home, whether they are stainless steel, white, or black, is that they should all match! If your kitchen appliances are in really bad shape, you might consider buying new ones. They don't have to be expensive. The fact that they are new and clean will have a lot of appeal to home buyers. If you have an older, but still functional electric stove, buy shiny new burner plates. Make sure the entire stovetop gleams as much as the new burner plates. Your oven and dishwasher should be spotless inside and out when staging the kitchen. Home buyers WILL open them to peek inside. If they are squeaky clean, buyers will get the impression that the appliances have been well taken care of. Remove the art gallery from your refrigerator door! Anything on the outside of the fridge will make the entire kitchen look cluttered. See cleaning your refrigerator for fridge staging tips. 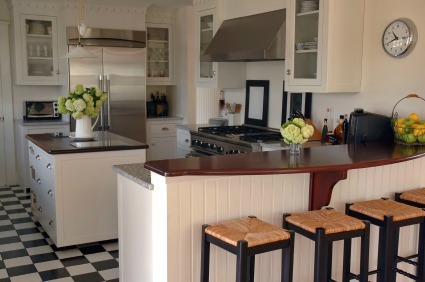 If you have a place at your kitchen island for seating, be sure to put bar stools or chairs under it. This will show buyers know that it’s a great place to hang out. Buyers love kitchen islands! If you have room, add a moveable unit. Don't crowd too many chairs around the island in the attempt to impress home buyers with the number of people who can fit there. The effect will only make your kitchen look smaller and crowded. Set out a couple of colorful placemats and table settings at the bar area when staging the kitchen. No island? If you have a single wall of kitchen cabinets and plenty of floorspace, consider getting an inexpensive rolling cart with an wood top and storage underneath. Another option is a free-standing butcher block table. Wood is a popular choice right now with many beautiful options available. Wood warms up a kitchen and home buyers will appreciate the extra storage and workspace. 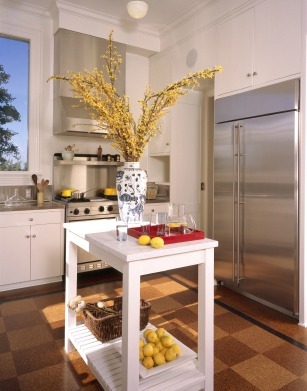 Another option when staging the kitchen is a free-standing table in the middle of the kitchen. A rustic farm table with warm wood tones will add charm and character, in addition to providing more work surface. You should have at least three feet of maneuverable space around an island. Eliminate clutter and clear off counters. Avoid creating lots of vignettes that can diminish the counter space. At most, add one item, like a flowering plant or bowl of fruit. Avoid using patterns in tile, flooring materials and fabrics. Patterns can be busy, and busy comes across as cluttered. 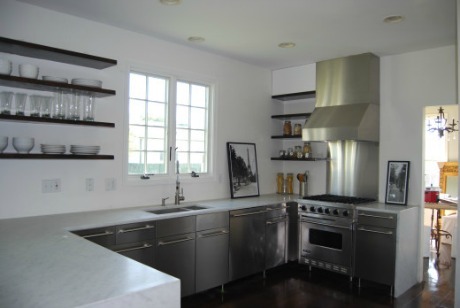 Use open or floating shelves, (as in the photo on the right) in place of upper cabinets. This can visually expand the space in a small kitchen by drawing your eye all the way to the wall. Floating shelves don’t have ugly hardware and brackets taking up valuable visual space. Use a light color palette of no more than two or three different tones. If cabinets and walls are all the same light color, the small space will appear larger. Limit the number of accessories on display on open shelves or inside glass-fronted cabinets. Keep them neat and arrange in odd numbers. See art of accessorizing. Paint the ceiling white to draw the eye upward. Use a cool color on the walls-- cool colors will cause a space to visually recede. Cool colors; blues, purples and greens; or look for neutrals with cool undertones. Use vertical lines in a small space with a low ceiling to draw the eye upward, like placing backsplash tiles vertically instead of horizontally. If your kitchen backsplash is busy, patterned or just plain gaudy, consider replacing it with classic subway tile in a light, neutral color. Expand and unify the kitchen by sticking to one neutral palette on the walls, cabinets, and backsplash. This includes electrical outlets as well-- match them (as close as possible) to wall colors to keep the eye from stopping at each one. I see many kitchens where the backsplash contrasts with these features, creating a staggering line of outlets and switchplates that break the flow of the eye. If you are putting in new kitchen cabinets, consider going all the way to the ceiling with the cupboards. Not only will this give you more storage space, it will create stronger vertical lines that will visually expand your small kitchen. See small kitchen decorating ideas for more tips. See color theory to view pictures of monotone and monochromatic color schemes that help small rooms appear more spacious than they really are. Open window blinds to let in as much natural light as possible. Make sure that the windows are sparkling clean! Turn on all the kitchen lights before viewings. If your cabinets are dark, paint your walls in a light neutral color. 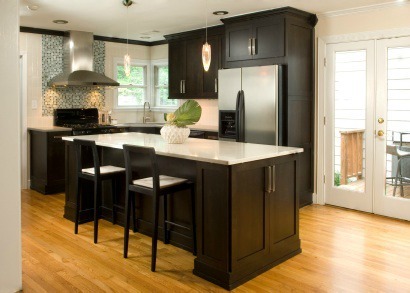 Dark cabinets will look striking against light walls. Create an accent wall in the kitchen to serve as a focal point. A darker pop of color will certainly add some excitement to the space. Place some floating shelves on the wall to add some depth and interest. When staging the kitchen for sale, don’t go too bold in your color choice, and keep the other walls neutral. If your kitchen lacks pizzaz, consider adding a new lighting fixture that will serve as a focal point and lend an air of elegance and sparkle. Kitchens have lots of hard edges that can be softened with window treatments. Add a simple window valance for color and texture. Keep the valance classic with clean lines. No poufs or ruffles, please. Large windows that let in too much blazing light can be treated with attractive sillouette blinds. Sillouette blinds filter and soften harsh glare and will cool the kitchen down. For kitchen nooks or eat-in kitchens with just enough room for a small table, see the video below by RealEstate4NH from the Home Staging Channel. Below is a video by "for dummies" with some basic tips on staging your kitchen for sale. The video contains one staging faux pas... let's see if you can spot it. Check your answer at the bottom of the page. What NOT to do in the staged kitchen! Don't leave bottles of dish soap, froggy soap dispensers, washrags, scrub brushes, and sponges at the sink. When I was a Realtor, I used to stash these items under the sink when doing open houses! Don't leave a dish rack next to the sink unless it's gorgeous and you have tons of counter space! Don't hang grimy dishtowels and potholders. Banish all magnets, photographs and shopping lists from the front of your fridge. Avoid cutesy fabric accessories and knick-knacks when staging the kitchen.They will look dingy and will make the kitchen look cluttered and dated. Avoid grouping lots of tiny objects together. The only impact they will have is one of clutter. Use large accessories-- they will become more important. Answer: The kitchen staging faux pas was the garbage pail left out in plain sight.